The shape symbolizes the Isuzu River which flows through the Ise Grand Shrine region, with the three ridges in the sweet bean paste representing the clear water that flows through the river, and the white mochi depicting the pebbles that lie on the riverbed. It is interesting to hear such symbolism but in reality, it won’t look that way when it reaches my stomach. It was a good dessert and something I recommend everyone should try when going to Ise. You may not want to stop by the main shop near the Naiku as it is really busy, but the Geku shop isn’t very busy and a nice place to be. 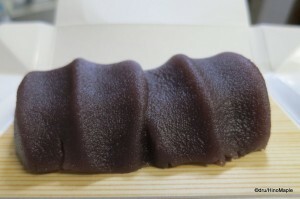 This entry was posted in Chubu Food and tagged Akafuku, anko, Dessert, Ise, japan, Mochi, Red Bean Paste, Rice Cake by Dru. Bookmark the permalink. I thought I had replied to this. Sorry for the late reply. I never knew about the expiration date scandal. Must have been a long time ago indeed. The last expiration date scandal I know of was the Shiroikoibito one. I did hear of the Meg Milk one too. Then again, it isn’t like Japanese products go bad that quickly. Next time you are in Nagoya, you can easily get it. I like it enough, but I’m not a big fan of anko. The shape symbolizes the Isuzu River? It makes me think of lucky golden poop!